PlaytestCloud Review – Earn Money For Playing Mobile And Browser Games! Published March 14, 2018 By Anna T. This post may contain affiliate links. Regardless, I only recommend sites I've researched and/or used and trust. This post was sponsored by PlaytestCloud. If you love playing mobile and browser games in your free time, you'll be excited to know you can actually get paid to do it! 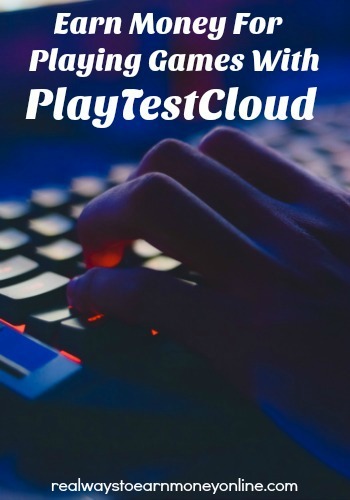 In today's review, I'm sharing a little info with you about PlaytestCloud, a completely legitimate company that pays game testers every single week for trying out games and then voicing their thoughts. This opportunity is open worldwide, and all you need to participate is a current smartphone, tablet, or Mac/PC along with a pair of headphones and a Paypal account. As you may have guessed, game developers need your feedback. And they need it badly enough to pay to get it. Developers want to release good games, and no matter how much they test out these games on their end prior to release, there is no replacement for actual user feedback. It's pretty simple. You create an account with PlaytestCloud and then just wait for an invitation to test a game (these will come via email). If you respond to a play test invitation, you'll have a chance to be randomly selected to try out a game for pay. According to PlaytestCloud's FAQ, most players get accepted to test games about every other week. If you're selected to test a game, you'll need to voice your thoughts about the game as you play. PlaytestCloud will record your game screen and your voice. Your camera will not be recorded, so no worries about being physically seen. The length of each play test and the payment amount varies, but you'll be given this information beforehand so you'll know what to expect. Most game tests take between 15 and 30 minutes. PlaytestCloud pays via Paypal, and payments are processed three times per week. This means that in most cases, your payment for a test will arrive just a few days (or sooner) after a test is completed and submitted. Payment for most tests if $9, but this can vary depending on the length of the play test. It goes without saying, but because of the amount the play tests pay and the fact you can't be sure how often you'll actually be selected, this should be considered an extra money opportunity. Don't depend on PlaytestCloud to help with paying bills. Instead, just think of this as a way to earn some money here and there for doing something fun. If you're ready to get started, just go here and fill out the form.